The Coffin Memorial Award is presented to a member who is not assigned to the Cadet Programs, who promotes, assists, anticipates in the Cadet Program and provides solution to cadet problems. 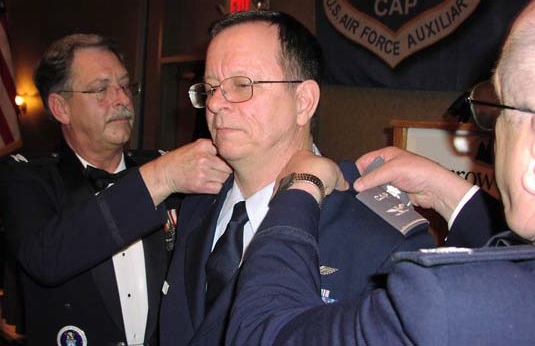 Col. Steve Miller, the outgoing commander of Minnesota Wing Civil Air Patrol, authorized that this year’s 2008 recipient would be Maj. Edwin Culbert of the Duluth Composite Squadron. MNWG CC Col Steve Miller is beside himself. 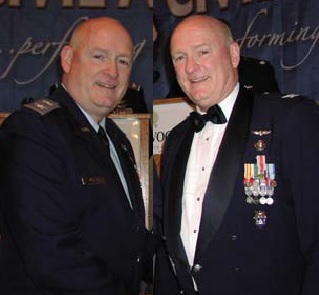 Maj Culbert would go on to be convicted in March of 2012 for a decades-old child molestation. His victim, who will be 34 years old in 2012 stated that the molestation — which occurred between 1990 and 1994 — disintegrated his relationship with his brother and parents, who continued to be friends with Culbert, not knowing what Culbert was doing. Newly promoted Col. Thomas Theis was named commander of the Minnesota Wing during the 61st Annual Minnesota Wing Conference, succeeding Col. Steven Miller, wing commander for the past four years. Theis was promoted by Col Dale Hoium and former Minnesota Wing Commander Col Kevin Sliwinski. Be the first to comment on "Col Stephen Miller Awards Major Edwin Culbert"